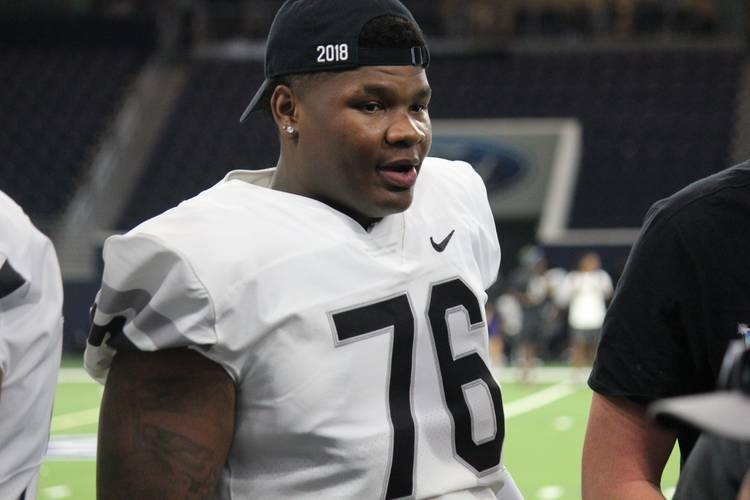 Five-star Tyler Johnson from Conroe Oak Ridge remains the lone offensive lineman committed to the Longhorns in the 2019 class. Two of the top targets remaining on the board – Javonne Shepherd and Stacey Wilkins – are in Frisco for The Opening Final. Both prospects measured in at 6-foot-7. Shepherd ran a 4.82 in the 40-yard dash at 327 pounds. Wilkins ran a 5.1. The two make for an athletic duo on a field full of the best big men in the country. Shepherd plays at North Forest, a Class 4A program in Houston. He’s not used to facing defensive ends who can match his size and strength. The four-star considers Texas and Texas A&M his top two schools, but plans on taking all five official visits before committing. The Longhorns are currently the leader, according to Shepherd. Wilkins is an Arkansas-native who named Texas among his top schools alongside Georgia, Miami, Arkansas and Oklahoma. He also plans on taking all five official visits and says he’ll commit in January at an all-star game of his choosing. He’s currently slated to play at The Polynesian Bowl to close out his senior season. Wilkins is among a group of high-profile commits and targets planning to take visits to Texas for the USC game. He and offensive line coach Herb Hand are also building a strong relationship. Wilkins was offered during a visit to Austin for junior day.